RED SUN sank in the West during 1972, somewhat in the punctured vein of the leaky Shalako, an ‘international’ genre gimmick flick. 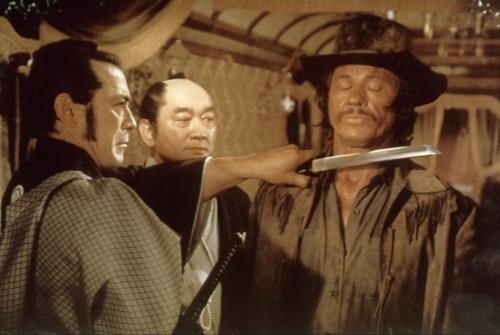 Charles Bronson represents us buckskinned yokels as an outlaw who helps Toshiro Mifune, a Japanese samurai (any other kind? ), track down a sword which was stolen by well-dressed bandit Alain Delon (named ‘Gauche’), stringing Ursula Andress and Capucine along for the killing sprees. Directed by Terence Young, who didn’t let his skill steering Dr.No, From Russia With Love and Thunderball get in the way of making this either shake or stir. Maurice Jarre did the score, which, oddly enough, sounds like a French composer’s idea of what an American western should sound like, especially one shot in Spain, directed by an Englishman, with accents from Switzerland, France and Japan spouting mouthfuls of corn. For the record, Toshiro was one of the Seven Samurai and Charlie was one of their cousins, The Magnificent Seven. Ursula, as always. displays some Andress in lieu of acting while poor Capucine is reduced to playing someone named ‘Pepita’. 112 minute silliness was a big hit in Japan and Europe, faring not so well in the U.S, 42nd place for the year. It has a bit of a cult following.